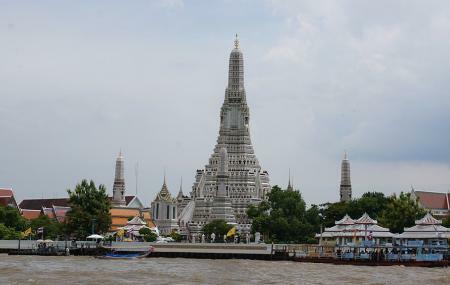 Temple of Dawn, or the Wat Arun is a Buddhist temple that sits on the western banks of the Chao Phraya River. This temple has derived its name from the Hindu God, Aruna who personified as the radiations of the rising sun. Wat Arun temple architecture is one of the best in Thailand, not just because it is located on the banks of a river, but because it is colourfully decorated with spires and murals. The best time to visit this temple is either early morning, before the crowds come in; or last in the evening towards the sunset. The temple’s spire stands tall over 70 metres high and is one of the most famous landmarks in Bangkok. This spire is decorated with coloured glass and Chinese porcelain that looks even more beautiful with sun’s rays falling over it. Home to bountiful attractions like Wat Pho Reclining Buddha, B T S Skytrain, Rajawongse Clothier, Grand Palace and Wat Phra Kaew, there are many things to do in Bangkok that you can explore on your visit. Temple Of Dawn is generally not available on the guided Bangkok tours, but there are plenty others that are worth visiting. Use Bangkok trip planner to visit Temple Of Dawn and many others to your visit. Oomph up your visit by adding the best hotels in Bangkok like Ibis Bangkok Riverside, Yellow Ribbon Hills Boutique Suites, Kokotel Bangkok Surawong and Marvin Suites. Find out how to reach Bangkok to begin with. Plenty of wholesome Bangkok vacation packages are available to choose from, pick your today! Dress appropriately while visiting the temple. Maintain silence once inside the temple as many Buddhist monks pray here. The mentioned price is for foreign tourists. Entry is free for locals. How popular is Temple Of Dawn? People normally club together Sulbing (Saling) Korean Town Bangkok and Tarawadee Resort & Spa while planning their visit to Temple Of Dawn. Wat Arun was definitely cool, but I don’t think it’s worth 50 baht to enter compared to the other areas and temples nearby. It takes maybe 15 minutes to walk around and take pictures of everything at Wat Arun, making it a very quick visit. If you go left from the entrance there’s another totally free temple, garden area, and monument to explore. Leading up to the Wat Arun entrance there’s an area with good and cheap food as well. Marvelous! The intricate tiling of the temple is just... I'm not sure if it is made of ceramic tiles or what, but it's really beautiful. They under maintenance when we got there, but still. Very scenic. Just be careful with the steps because they're a little steep and narrow. Great beautiful temple maid from Chinese ceramics, one of the must visit temples in Bangkok. You can go to that temple right after you had a ride on the canal boats. beware no air conditioning and may include small charges for food and tickets. Takes about an hour and a half to go through the temple. Usual temple dress code: Shirt that covers your shoulders, shorts for men, long dress/pants for woman Be respectful.